The Morris Minor, designed by Alec Issigonis (who was later responsible for the Mini) was introduced at the 1948 Motor Show, and in 1965 became the first British car to exceed 1 million built. Over 1.6 million were built, mainly at the Cowley, Oxford, plant before production came to an end in 1971. Later models were known as the 'Minor 1000' to reflect the larger engine - this example has the post-1962 specification with a 1098cc overhead valve engine and 4 speed synchromesh gearbox. 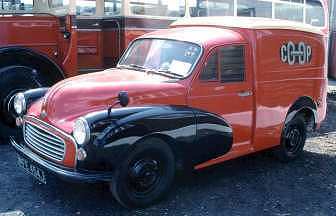 The Light Commercial Vehicle (LCV) van / pick-up truck was added to the range in 1953, and unlike the integral car version, had a separate chassis. Many were bought by the Post Office / Royal Mail. Later examples of the LCV were built at the Longbridge, Birmingham plant. This was one of the last Morris Minor vans built, and on withdrawal from use, it was restored by the Co-op Transport Department in their livery of the 1960's, and presented to the LVVS by the Lincoln Co-operative Society. April 2010 - The van had some fuel problems. This has been cured by fitting a new electric fuel pump. The van is now ready for its MOT. July 2010 - The Morris has passed its annual MOT.